When an old acquaintance I hadn’t seen in several years came with her children for a play date, I was so embarrassed by her comment. I made all the excuses for why my apartment was not as “organized” as it used to be. I felt like such a loser. When she left, I started cleaning up all my stuff. I got so tired, that I shoved some of it under the bed and the rest in closets where my stuff could not be seen. I was upset, but then it dawned on me. It’s hard to be a mom. Period. Then add on having hypothyroidism. She was right. Something did happen. I took off my Supermom Cape. When I was pregnant with my first son I had fantasies of being a supermom. Then fatigue came crashing over me. I watched other mothers doing it all and I tried to keep up. I could barely keep my eyes open but I pushed myself to be a supermom keeping up my perfect career, home, and family. I knew that I was struggling and I felt like a failure. I became pregnant again and miscarried needlessly from hypothyroidism. That was the tipping point when my hypothyroidism symptoms raged high and I hit rock bottom. To tell you the truth I don’t know how I made it through that dark time in my life. I found myself unable to keep my eyes open. I knew that something was very wrong. Here is a powerful video created by Dr. Steven Hotze, author of the book Hypothyroidism, Health & Happiness: The Riddle of Illness Revealed. This video gave me goose bumps. Sometimes that feeling of not being a good mom comes over me. I don’t always have enough energy to keep up with everything. I get tired just watching all the other moms racing their children around to all their activities. But that’s okay. I remind myself. I’m so thankful that I finally found a great thyroid doctor. I’m feeling better than ever but I never want to go back to that dark place again. I know my limitations. I know that stress is my number one killer. Emotional and physical stress can take me down in one quick punch. I put so much of myself into caring for my children, I end up neglecting myself. I have to be so careful. I need to be good to myself and not feel guilty about it. To care for others, you must care for yourself. I have my hands full balancing life with my two beautiful boys Benjamin and Hudson. When that inner voice whispers that I’m a failure as a mom because I don’t have the energy to keep up like everyone else, I try my best to remind myself of one important thing. 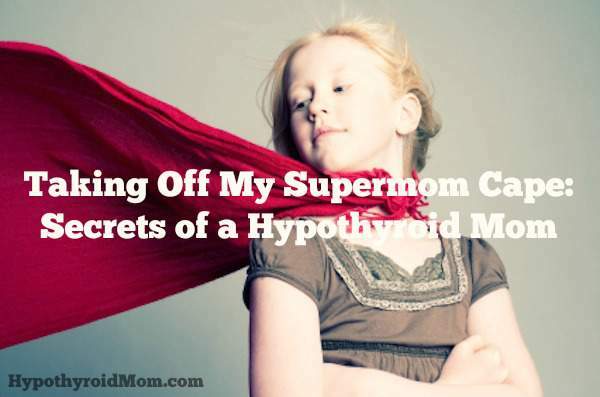 Step into my shoes and walk the life I’m living and if you get as far as I am, just maybe you will see what an AWESOME HYPOTHYROID MOM I really am. Hi Gretchen, This is Dana Trentini from Hypothyroid Mom. Several months ago I closed down my newsletter. I’ve long wanted to restart it but with a different approach that I think will be more helpful to my subscribers. Stay tuned because I will be starting my new newsletter in a few months and I hope you’ll join me.